Lower concentrations of harmful pollutants were recorded last year, including the tiny particulates that can penetrate deep into the lungs – but roadside- dominant nitrogen dioxide remains a headache for the city, with most figures failing annual air quality targets. And while ambient concentrations of hazardous ozone fell for the second consecutive year, they are proving stubbornly hard to cut having increased 15 per cent since 1999. The preliminary air quality data for 2016 was released by the Environmental Protection Department yesterday. (SO2) by 10 per cent. Similar drops were recorded at general stations. Fewer hours and days of high health risk air were recorded at both ambient and roadside stations last year. But although roadside concentrations of nitrogen dioxide (NO2) – a product of fuel combustion – fell by 17 per cent, the average annual concentration of 82 micrograms per cubic metre of air was still more than double the annual air quality objective target of just 40. All three roadside monitoring stations also fell short of the air quality objectives for acceptable annual NO2 levels last year. “Roadside NO2 remains a very big challenge as reduction technologies available now are not that sophisticated,” assistant director of air policy Mok Wai-chuen said. He believed improvements in particulate pollution were a result of policy measures such as an ongoing scheme to phase out old diesel commercial vehicles progressively and new laws requiring ships at berth to switch to low- sulphur fuel. “This proves our policies to tackle particulate matter have been effective,” he said, adding that other measures such as tightening emission controls are being looked at. conditions such as tropical cyclones. Ozone is formed through a reaction of nitrogen oxides (NOx) and volatile organic compounds (VOCs) in the air and under sunlight. It is a main component of photochemical smog – which gives a dusk sky a lurid, orange tint – and at elevated levels, can cause or aggravate respiratory diseases. Asked if the toxic smog plaguing northern China could have drifted south, he said “it could not be ruled out” but “was of low possibility”. “uncontrolled growth” of road vehicles. Wang Tao, chair professor of atmospheric environment at Polytechnic University, said the increase in regional ozone had indeed slowed since 2013, but not fallen. More control of precursors, such as VOC and NOX, were needed on both sides of the border, he said. Air pollution is prematurely ageing the faces of city dwellers by accelerating wrinkles and age spots, according to emerging scientific research. The effects of toxic fumes on skin are being seen in both western cities, such as London and New York, as well as in more visibly polluted Asian cities and in some cases may be the primary cause of ageing. The pollution is also being linked to worsening skin conditions such as eczema and hives. The scientific discoveries are now driving the world’s biggest cosmetics companies to search for solutions, including medicine-like compounds that directly block the biological damage. But doctors warn that some common skin care routines, such as scrubs, make the damage from air pollution even worse. Poisonous air is already known to cause millions of early deaths from lung and heart diseases and has been linked to diabetes and mental health problems. But perhaps its most visible impact, the damage caused to skin, is just beginning to be understood. “With traffic pollution emerging as the single most toxic substance for skin, the dream of perfect skin is over for those living and working in traffic-polluted areas unless they take steps to protect their skin right now,” said Dr Mervyn Patterson, a cosmetic doctor at Woodford Medical clinics in the UK. Air pollution in urban areas, much of which comes from traffic, includes tiny particles called PMs, nitrogen dioxide (NO2) and chemicals such as polycyclic aromatic hydrocarbons (PAHs). “What is very clear is that PMs are a problem for skin,” said Krutmann, whose work has shown PMs increase age spots and wrinkles. But one of the his newest studies showed NO2 also increases ageing. They studied people in both Germany and China and discovered that age spots on their cheeks increased by 25% with a relatively small increase in pollution, 10 microgrammes of NO2 per cubic metre. Many parts of the UK have illegally high levels of NO2, with London breaking its annual limit in the first week of 2016, with levels reaching over 200 microgrammes of NO2 per cubic metre. Understanding exactly how air pollution causes the skin damage is at an early stage, according to Krutmann: “We are just now dipping into the mechanisms.” But many of the pollutants are known to pass easily through the skin and cause a variety of impacts. Dr Debra Jaliman, a skin expert based in New York City, says her patients are now worrying about the impact of air pollution on their skin, which she said can cause darkening of the skin and acne-like eruptions, as well as ageing. “At the moment, there are not many products for prevention [of air pollution damage], however it may be a trend in the coming years as it becomes a much bigger issue,” she said. Major beauty companies have begun their own research and are launching the first products formulated to battle skin damage from toxic air. Dr Frauke Neuser, senior scientist for Olay, a Procter and Gamble brand, has run studies showing significantly lower skin hydration in people living in polluted areas and lab studies showing that diesel fumes and PMs cause inflammation in skin cells. Frauke’s work has also shown direct correlations between spikes in PM air pollution in Beijing and an increase in hospital visits by people with skin conditions including hives. “This indicates that not only skin ageing but also skin health are affected by air pollution,” she said. L’Oreal, another cosmetics giant, published a medical study in 2015 showing that eczema and hives were more common in people in Mexico exposed to higher levels of air pollution, a conclusion supported by separate research in Canada. “The next step is to understand more deeply the environment-induced damages, in order to develop skin ageing prevention routines and products,” said Dr Steve Shiel, scientific director at L’Oreal. Clinique, a big makeup brand, has already launched a sonic face cleansing brush it claims better removes pollution. “This [air pollution] is not going to go away. This is not a problem that is easily fixed,” said Janet Pardo at Clinique. However, researchers are now working on medicine-like compounds that block the damage from air pollution from occurring in the first place. Krutmann’s lab helped Symrise, one of the world’s biggest suppliers of cosmetics ingredients, identify one, though the lab has no commercial stake in the product, which is called SymUrban. “If your skin is really healthy, it is quite a good barrier,” he said, explaining that the top layer is like a roof – flattened cells like tiles separated by protective lipids. Patterson is also dismissive of face scrubs: “The skin is trying its damnedest to make this wonderful defence mechanism and what do women and men do? They scrub the hell out of it. It just doesn’t make sense.” He said products that help repair the skin barrier, by delivering the pre-cursor lipids the cells need, are beneficial, as are ones that tackle inflammation. The World Health Organization (WHO) recently released its latest global urban air pollution database, including information for nearly 3,000 cities—a doubling from the 2014 database, which itself had data from 500 more cities than the previous (2011) iteration. These increases in coverage in air pollution measurement and reporting is encouraging, but the WHO numbers reveal that we still have a ways to go to construct a comprehensive and accurate picture of global air quality. WHO singles out Onitsha, Nigeria and Zabol, Iran as the cities with the world’s worst air pollution, the first for elevated coarse particulate, or PM10, levels and the second for extreme fine particulate, or PM2.5, concentrations. The air in Onitsha and Zabol is, in other words, bad, though just how bad we cannot say with certainty. Global air quality is worsening, human exposure to air pollution is on the rise, and deaths caused by these toxins have increased from 4.8 million in 1990 to 5.5 million in 2015. These trends are not, however, represented evenly throughout the world. Developing nations, those experiencing rapid industrial and urban expansion, bear the brunt of air pollution’s pernicious effects. The air in cities like Onitsha and Delhi has worsened as their populations and polluting industries have grown, while New York and London’s air quality has steadily improved. And yet it is developing cities and nations that are least equipped to monitor and manage their ambient environment. WHO’s latest air quality database underscores this problem, as nations with the most resources have steadily increased air quality monitoring and reporting and have seen their air quality steadily improve. Developing countries have experienced deteriorating air quality alongside economic growth, as measurement in these places lags behind. The vast majority of ground-based monitors are located in Europe and North America meaning there are major “blindspots” obfuscating where air pollution is affecting the most people in the most pernicious ways. These blindspots are why we need new ways to monitor global air pollution. The 2016 Environmental Performance Index (EPI) reveals the extent to which ground-based air monitoring and reporting is missing areas suffering from some of the world’s worst air pollution. Using satellite data, researchers at Dalhousie University have estimated ground-based exposures to fine particulate pollution or PM2.5—microscopic particles that can penetrate deep into human lung and blood tissue, leading to cardiovascular disease and other serious health impacts. These satellite data have advantages as well as their disadvantages compared to ground-based information. Satellites offer a globally-consistent, long-term, and dynamic view of air pollution levels, exposures and trends. Satellite data provide a picture of the average PM pollution that an individual living in a particular place would be exposed to on a typical day, potentially smoothing out outlying spikes in air toxin concentrations. These data can be used to gauge pollution’s impacts on human health – in total, Global Burden of Disease estimates outdoor and indoor air pollution is responsible for 5.5 million premature deaths a year. Satellites do not, however, measure air pollution at the ground level, where people live and breathe, which is why governments need to invest in ground-based monitors. 1. Nearly half of the world’s people breathes unsafe air, with populations in developing countries disproportionately exposed. One-third (1.3 billion) of these people live in the East Asia and Pacific region, where in China and South Korea more than 50 percent of their populations are exposed to unsafe levels of fine particulate matter. In India and Nepal, the percentage is nearly 75 percent – a figure reinforced by WHO’s 2016 database, showing that 16 of the world’s 30 most polluted cities are in India. In our interactive map areas shaded red or darker experience air pollution that exceeds 10 micrograms/m3 – the threshold WHO considers unsafe for people to breathe. 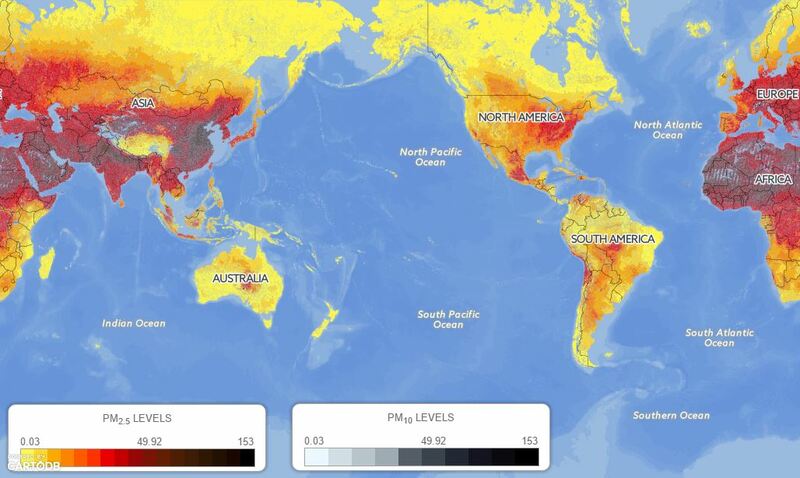 The map shows that East Asia, Northern India, and Northern Africa have the world’s highest levels of fine particulate pollution. GLOBAL EXPOSURE (IN MICROGRAMS PER CUBIC METER) TO FINE PARTICULATE POLLUTION (PM.5). 2. Nitrogen dioxide pollution, produced mainly from fossil fuel combustion, is a precursor of ozone and smog and mostly affects Europe and East Asia. In Europe, tax policies dating back to the 1970s and regulations from the 1990s designed to limit tailpipe CO2 emissions have encouraged the production and use of diesel vehicles, resulting in elevated NO2 levels. While diesel vehicles generate 15 percent less CO2 than their gasoline counterparts, diesel engines emit four times more NO2. In London, NO2 pollution is linked to 9,500 deaths annually. These data, derived from satellite estimates, show that air pollution is not only a developing world problem, but that industrialized countries also suffer from foul air. European cities, however, are implementing ambitious policies to reduce air pollution, such as the British capital’s Ultra Low Emissions Zone, which is expected to cut central London’s pollution in half by 2020. Overall air quality has improved in Europe in the last decade, while pollution continues to worsen in most of Asia, Africa, and Latin America. GLOBAL EXPOSURE (IN PPM) TO NITROGEN DIOXIDE (NO2). 3. Global monitoring is improving, primarily in developed countries. Figure 3 shows increases in the number of cities monitoring air pollution from the WHO’s 2011, 2014 and 2016 databases. Cities monitoring air pollution have increased in number to the greatest extent in Europe and high-income countries in the Americas in the last five years. 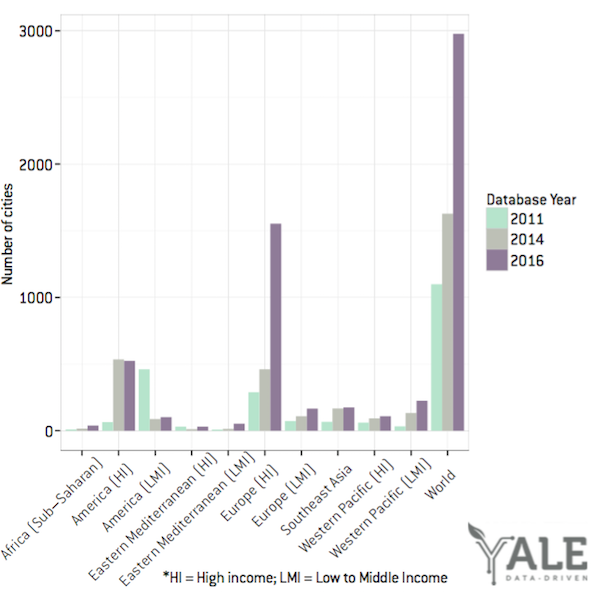 Progress in lower to middle-income countries has been much slower. 4. Governments that have implemented policies to control air pollution have reduced deaths. New data released in February of this year as part of the Global Burden of Disease (GDB) project show that 5.5 million premature deaths occur each year due to air pollution. Looking at GBD data over 10 years (Figure 4), key trends emerge. 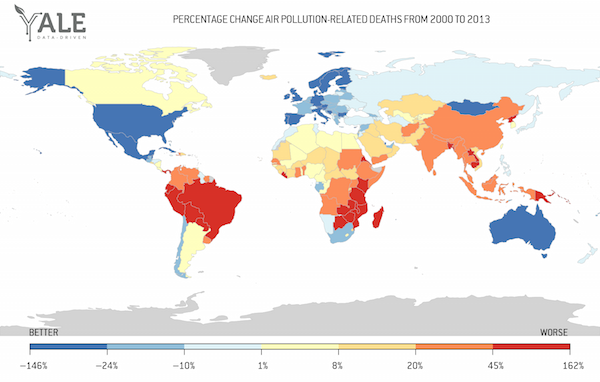 Air pollution-related deaths in Latin America, Sub-Saharan Africa, and Southeast Asia have worsened more dramatically than other regions the last decade. The United States, European Union, and Australia have significantly reduced air pollution-related deaths, largely due to policy interventions targeted at industrial pollution control, reducing fossil fuel consumption, and improving fuel quality in the transport sector. 5. New sources of air pollution detected. Recent studies show that a major contributor to air pollution is shipping. This finding is particularly salient in coastal regions in East Asia. Forty-two percent of Hong Kong’s particulates, for instance, are from the maritime sector. And East Asia has experienced the highest number of shipping-related air pollution deaths. A new study shows that air pollution from the agriculture sector exceeds anthropogenic sources of particulate pollution in the United States and Europe (Figure 5). These studies underscore air pollution’s complex origins, as airborne toxins come from many different sources and activities, both natural and human-driven. The mix of sources makes it ever more challenging to design policies and interventions to address this class of pollutants. Despite the challenges, the imperative is clear: more efforts must be made to reverse the current trends, to reduce human exposure to air pollution and to improve global air quality. 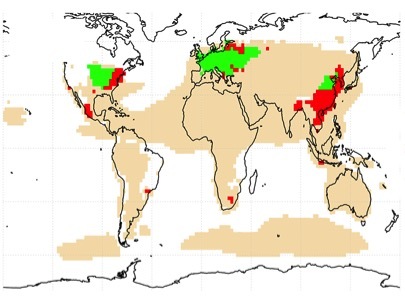 DOMINANT CONTRIBUTOR TO PM2.5 CONCENTRATIONS WITH RESPECT TO NATURAL (BEIGE), ANTHROPOGENIC (WITHOUT AGRICULTURE IN RED), AND AGRICULTURAL SOURCES (GREEN). SOURCE: BAUER ET AL. (2016). More than 1 billion people live in countries that do not monitor the air they breathe, according to data released by the World Health Organisation (WHO). Guardian analysis has revealed a great air pollution blindspot stretching the length of Africa, across large parts of the former Soviet Union, south-east Asia and the Caribbean. In 92 countries the monitoring equipment and staff needed to measure one of the world’s most deadly pollutants – particulate matter (PM) – are simply not available. A further 33 countries, including Indonesia, Egypt and Russia monitor just one or two cities. Outdoor air pollution kills 3.3 million people each year and it is getting worse. Globally, pollution levels have risen by 8% in five years. But there are signs that it can be brought under control. According to the WHO, pollution is falling in many places where monitoring occurs, including a third of cities in low- and middle-income countries. In those countries with no checks, citizens’ lungs remain the only place where pollution is recorded. People may be acutely aware of the corrupted air, but without the evidence that global or national standards have been breached, there is little imperative for governments to act. The WHO data, made public last week, showed air pollution was a hallmark of global inequality. Where it is monitored, denizens of poor cities are almost twice as likely as the rich to be breathing bad air. Poverty is also a common theme. 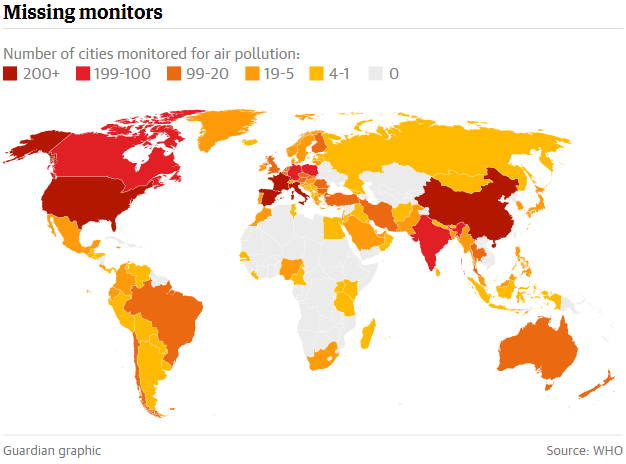 Of the world’s poorest 50 countries by GDP per capita, 35 are not monitoring air in any of their cities. Because they are predominantly poor- to middle-income, unmonitored countries are very likely to have high air pollution in their cities, meaning the majority of city-dwellers in those places will be be unknowingly exposed to pollution that breaches WHO standards. The cost of setting up a single monitoring station is currently around $150,000-200,000, according to the UN Environment Programme. This does not include the ongoing staffing and maintenance costs. Although new technology may be significantly cheaper. In Africa, the world’s poorest continent, just 10 out of 54 countries are doing any monitoring at all. Africa has just 1.3% of the cities where the WHO records air quality, despite having 16% of global population and cities set to set to triple in size in the next 50 years. But it is not only the poor who lack information – the poorly governed also live in the dark. The Economist Intelligence Unit’s (EIU) democracy index labels 51 countries as “authoritarian”. Of these, 36 do not monitor their air. Just five non-monitoring countries appear in the democratic top 50. In post-Soviet states, most of which rank as middle-income countries, barely any investment has been made in keeping tabs on the air. Across the vast expanse of Russia, with its thousand towns and cities, only Moscow records air quality. Tiny Latvia boasts more monitoring stations than its former imperial master. Only the three Baltic states – Latvia, Lithuania and Estonia – have managed to implement thorough surveillance. Each of these rates above 7 out of 10 on the EIU index – Russia scores 3.31. Even in countries where democratic freedom is limited, public information about air pollution can force great change. In China, the public outcry that followed the release of air quality data by the US embassy at Beijing’s forced the Communist party to make air a national priority. The consequent control measures, including a mass shutdown of coal power stations and steelworks, has lead to falling pollution in some of the worst-affected Chinese cities. The pressure has also encouraged more monitoring. In China, 210 cities are now monitored, compared to 111 just two years before. This fits with an improving trend across the world. In 2014, 1,622 cities were monitored. Now it’s 2,974. With high costs associated with monitoring, it is necessary to target high-risk areas first. One satellite study found that 96% of west Africans live above the WHO guidelines. However satellite observations are notoriously inexact. Professor Randall Martin is head of the Spartan project, which operates a network of on-ground sites at which satellite measurements can be calibrated. “Satellite remote sensing offers a global observation source to fill that monitoring gap,” he said. With these improvements, the blindspot is growing smaller. The number of cities monitored in Africa has doubled, with the notable addition of Nigeria. Africa’s most populous country had no cities being recorded in 2014. Now it has 12, with the city of Onitsha named as the worst city in the world for PM10 (particles under 10 but above 2.5 microns in width) pollution. Similarly, because of an expansion of monitoring in Iran, the city of Zabol has superseded Delhi as the city with the worst fine particle (PM2.5) pollution. With hundreds, perhaps thousands, more cities (including Lagos, Nigeria’s largest conurbation) waiting for the fog to be lifted on their own air quality, it is unlikely these two will remain at the top for long. More than 80% of people living in urban areas that monitor air pollution are exposed to air quality levels that exceed WHO limits. While all regions of the world are affected, populations in low-income cities are the most impacted. According to the latest urban air quality database, 98% of cities in low- and middle income countries with more than 100 000 inhabitants do not meet WHO air quality guidelines. However, in high-income countries, that percentage decreases to 56%. In the past two years, the database – now covering 3000 cities in 103 countries – has nearly doubled, with more cities measuring air pollution levels and recognizing the associated health impacts. WHO was able to compare a total of 795 cities in 67 countries for levels of small and fine particulate matter (PM10 and PM2.5) during the five-year period, 2008-2013. PM10 and PM2.5 include pollutants such as sulfate, nitrates and black carbon, which penetrate deep into the lungs and into the cardiovascular system, posing the greatest risks to human health. Data was then analysed to develop regional trends. Global urban air pollution levels increased by 8%, despite improvements in some regions. 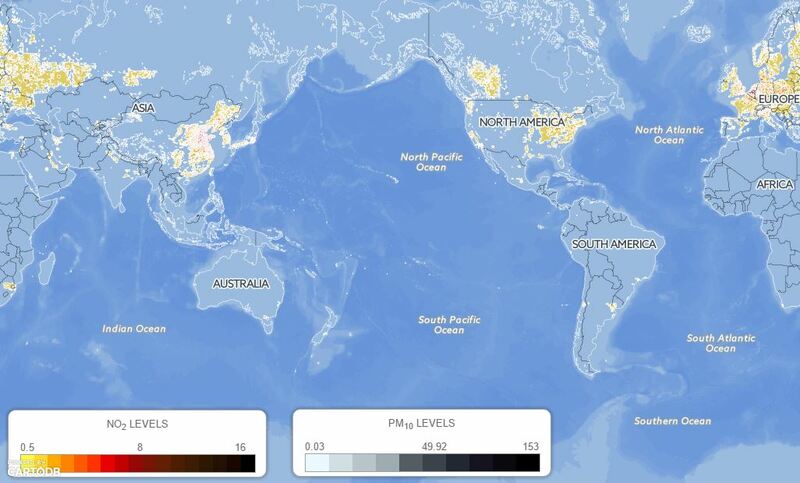 In general, urban air pollution levels were lowest in high-income countries, with lower levels most prevalent in Europe, the Americas, and the Western Pacific Region. The highest urban air pollution levels were experienced in low-and middle-income countries in WHO’s Eastern Mediterranean and South-East Asia Regions, with annual mean levels often exceeding 5-10 times WHO limits, followed by low-income cities in the Western Pacific Region. In the Eastern Mediterranean and South-East Asia Regions and low-income countries in the Western Pacific Region, levels of urban air pollution has increased by more than 5% in more than two-thirds of the cities. In the African Region urban air pollution data remains very sparse, however available data revealed particulate matter (PM) levels above the median. The database now contains PM measurements for more than twice as many cities than previous versions. Ambient air pollution, made of high concentrations of small and fine particulate matter, is the greatest environmental risk to health—causing more than 3 million premature deaths worldwide every year. Most sources of urban outdoor air pollution are well beyond the control of individuals and demand action by cities, as well as national and international policymakers to promote cleaner transport, more efficient energy production and waste management. More than half of the monitored cities in high-income countries and more than one-third in low- and middle-income countries reduced their air pollution levels by more than 5% in five years. Reducing industrial smokestack emissions, increasing use of renewable power sources, like solar and wind, and prioritizing rapid transit, walking and cycling networks in cities are among the suite of available and affordable strategies. During the World Health Assembly, 23-28 May, Member States will discuss a road map for an enhanced global response to the adverse health effects of air pollution. WHO’s Air quality guidelines offer global guidance on thresholds and limits for key air pollutants that pose health risks. The Guidelines indicate that by reducing particulate matter (PM10) pollution from 70 to 20 micrograms per cubic metre (μg/m), air pollution-related deaths could be reduced by roughly 15%. The WHO urban air quality database builds on well-established, public air quality monitoring systems as a source of reliable data in different parts of the world. National efforts to create operational and representative air quality monitoring systems should be strongly encouraged and supported. The primary source of data include official reporting from countries to WHO, and official national and sub-national reports and web sites containing measurements of PM10 or PM2.5. Measurements reported by the following regional networks were used: the Clean Air Asia for Asia and the European Environment Agency for Europe’s Air Quality e-Reporting database. In the absence of data from the previous sources, data from UN and development agencies, peer-reviewed journal articles and ground measurements compiled in the framework of the Global Burden of Disease project were used. Annual mean concentrations of particulate matter (PM10 and/or PM2.5) based on daily measurements, or data which could be aggregated into annual means, were included in the database. In the absence of annual means measurements covering a more limited period of the year were exceptionally used.